It's hard to believe that Baby Tobe will be 9 months at the end of October. Man it went by so fast, yet so slow... Ha Ha. But it's been so much fun! I searched the internet high and low for the "best" items to buy and found it overwhelming. It really is a matter of personal preference and what works best for you and your baby. But after some trial and error, these are the items that worked best for us. 1. Little Giraffe Chenille Receiving Blanket in Silver. many colors to choose from, but what a soft cuddly blanket for a newborn in the winter months. Great for tummy time and play gym time also. 2. Petunia Pickle Bottom Diaper Bag in Classically Crete City Carry All. I Love Petunia for all the compartments they think up. Comes complete with a plastic wipe case and a pocket for it, a removable changing pad, pockets for keys, cellphone, extra clothes, wallet. You name it. And Oh So stylish too. 3. Little Giraffe Box of Socks in Blue (shown here in pink). 6 Pairs of super soft socks that actually stay on those little newborn toes. 4. Aden & Anais Easy Swaddle (shown here in For The Birds, Owl) So, this easy swaddle was introduced by Aden & Anais almost the moment we transitioned out of the swaddle. We use a brand that shall not be named with the noisy velcro. I tell you, I wish I had these because they snap. That little man would scream every time I pulled the Velcro away. Plus, he would be very warm and this muslin fabric is so much more breathable than whatever that other one was made of. And I could not master the swaddle with the square blankets, so this was fool proof! 5. Aden & Anais Cozy Slumber Sleep Sack. I think we will have one of these in every pattern before he's no longer using them. So light for the summer months being only 2 layers of muslin, and pretty soon we will transitioning into the 4 layer for a little extra warmth. Since it's suggested you don't use blanket, you can rest assured that baby will be snug enough in this sleeping bag for the night. And these are manufactured in line with Safe Sleeping guidelines to prevent SIDS. 6. Aden & Anais Burpy Bib in Azure (shown in Moonlight Solid). GREAT burp cloths for nursing and bottle feeding. Then when baby starts eating solids, there is a snap in the curve that can snap around the neck to act as a regular bib. If you want to have some serious fun, you can turn it around and use it as a cape. These are made from bamboo, so if you are concerned about pesticides then these are the bibs for you. 7. Aden & Anais Swaddle 4pack We have so many of these swaddle squares, I can't keep up. We use them for EVERYTHING!! 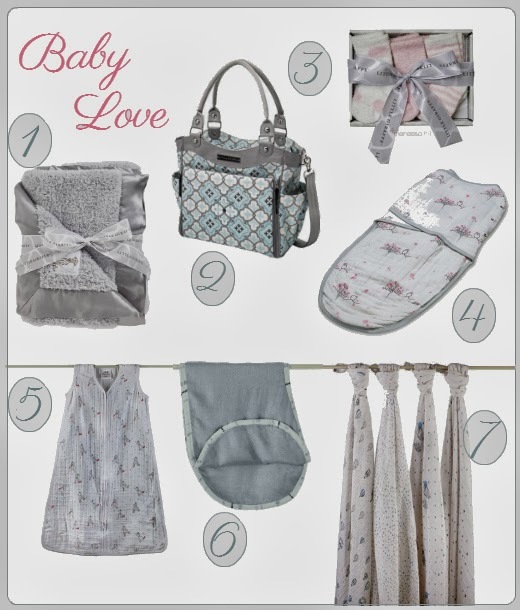 Nursing covers, stroller or car seat covers, tummy time, window shades in the car, hammock fun, receiving blankets. And I know, I know, Target sells them for less money. Well guess what, the quality is just not the same and they are smaller in size too. I received some as a gift, and am ever so grateful to the giver, but there really is no comparison. I just thought I'd give a shout out to a couple items I love that we don't carry as well. - Sophie the Giraffe. Best chewy teether on the market. - Honest Diapers. I thought I was going to do cloth, couldn't hack it. So I love these for how they're made. Plus, you can set up an automatic shipment with enough diapers and wipes for about a month. - Raw Baltic Amber Teething Necklace. Not for chewing, but for wearing as Raw Baltic Amber contains succinic acid - a powerful antioxidant that relieves pain, reduces stress and boosts the immune system. We don't wear it around the neck but double up around the ankle. - And for Local's I HIGHLY recommend ALL services, classes and groups at Babies in Common in Grafton. Nursing Bra's, Baby Carriers, Breastfeeding Groups and classes, Birthing Classes. There is so much. Honestly, this was my resource for everything new mommy. From the beginning of pregnancy Jeanette recommended the Midwives, the right classes to prepare for birth, and Little T and I spent many days at BINC in the first few months learning how life with a newborn goes and how most of the things I thought I was crazy about, were completely normal. So check them out if you are expecting or know someone who is and pass the knowledge along.